We do presentations that change behavior. Our Mission is simply helping others. our focus is not making money. When you can perform and you KNOW you can perform, the attitude is "bring them on". "Them"... being the challenges and the problems. We have programs that teaches the participants how to internalize information. We also emphasize the joy of learning. It is our belief that Herzberg's theory that meaningful work is a true satisfier is right on target. True happiness is discovering what you love doing, and then becoming one of the best at doing it! The greatest joy is having a job you love and arising from bed with the thought, "I can't wait to get to work". Sounds impossible? We help people get there. We start by delivering the most effective training in the industry. No one does it better! Our presentations never end. Please ask us how we achieve this goal. Enthusiasm is the mark of our team of instructors . Our Technologists have an additional characteristic. Creativity is what sets our people apart. 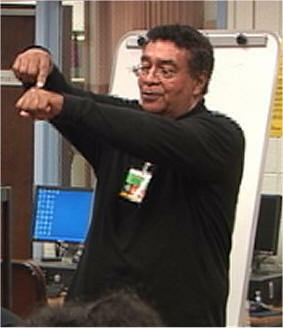 Our Instructors are, in addition, motivational speakers. Take note , that many instructors and motivational speakers can ignite a class or audience. But often , weeks later, the same undesirable behavior surfaces. To counter this phenomenon Our workshops all have a maintenance program. We have designed procedures, memory joggers and job aides they help you remain motivated and competent, years after the course is over. We use our ingenuity and creativity to help you accomplish your goals and maintain the level of excellence you have achieved. If your employees are burned-out, discouraged because of downsizing or reorganization or functioning badly because retirement is less than a year away.